Coming back from Oxford at lighting up time this week I was reminded just how far behind our northern european neighbours we are when it comes to being cycle friendly. A few years ago you’d rarely see another soul along the A40 cycle path, and having a good light to see by was just a case of buying the brightest one you could afford. On dark country roads this even seemed an advantage in that it made approaching drivers think twice about exactly what it was coming towards them. 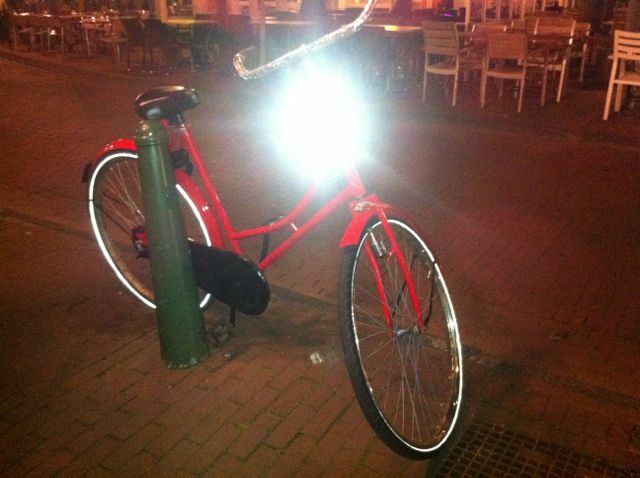 Now though, it’s just a pain in the retina for fellow bicycle users – as cycling becomes more popular, so being blinded by the latest photon light bomb coming towards you becomes more common. This entry was posted in WitneyBUG and tagged bikes, components, dutch, german, lights, roadsafety, words on Thu 18 Oct 2012 by kevin hickman. This entry was posted in TGiF and tagged bikes, flick, french, lights, music, paris, video on Fri 6 Jul 2012 by kevin hickman.